Please note that applications to volunteer at Cheltenham Science Festival 2018 are now closed. Please check back here in February 2019 for information on volunteering at Cheltenham Science Festival 2019. 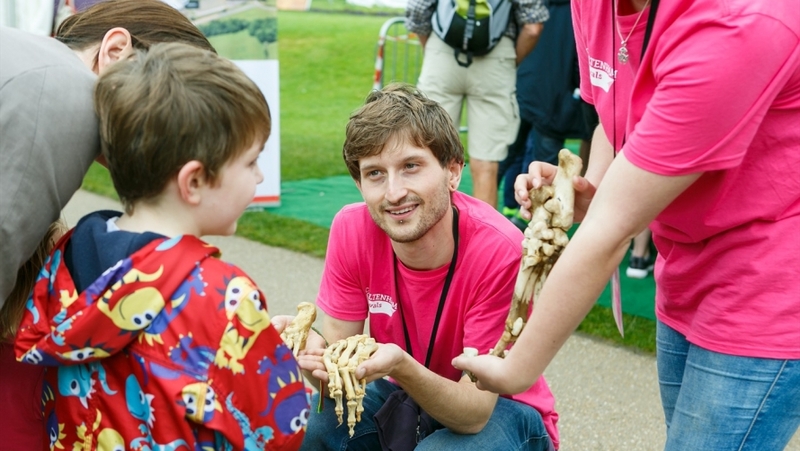 Cheltenham Science Festival is looking for friendly, hard-working and enthusiastic volunteers. Volunteers will be needed from Sunday 3 June – Monday 11 June to help with all aspects of running a successful festival. This would be a valuable experience especially for those passionate about arts administration, events management and stage production. Volunteers are asked to commit to full time for the duration of the Festival. Working hours during the festival are long and tiring. Days often start at 8.30am for morning briefing and don’t finish until the last event has finishes, sometimes as late as 11pm. We do accept part time volunteers from the local area as part of our Welcome Team – for details click here. We are looking for highly motivated and reliable volunteers who will be happy to do whatever task is required of them. Volunteers will need to have good teamwork skills, initiative, and the stamina to work long hours. Evidence for a passion for Science and/or skills in events management would be a plus. Applications for volunteering at the Science Festival have now closed. Check back here in February 2019 for information on volunteering at Science Festival 2019.